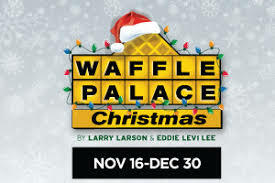 We may just want to shout out “They’re Back!” Larry Larson and Eddie Levi Lee, who have partnered to craft many a play, have put together this sequel to their Waffle Palace play. You know you are sitting in the diner which is designed by Moriah and Isabel Curley-Clay, and almost touching the staff and the patrons who come and go, as the business tries to survive a bleak holiday. Four of the actors from the prequel have returned to reprise their roles. Marguerite Hannah is the waitress, now a partner, named Connie. Maria Rodriguez-Sager comes back at the waitress, Esperanza, from Nicaragua, albeit she is now pregnant. Allan Edwards comes on in four roles one as Hugo the hubby of Esperanza, who has some deep thoughts about impending paranthood. And Lala Cochran is in her usually funny roles as a business woman and some other roles. The cast is rounded out by Barry Stoltze who is the partner with Connie. Jennifer Alice Acker who is one of those customers who buys a coffee and spends the day on the Wi-Fi. Markell Williams is Deandre, the nephew of Connie who comes on to work the grill; and that mean old Christmas devil is played to the hilt by Rob Cleveland. But, rest easily. This is holiday season. Nobody gets harmed, and all comes out well in the end; except maybe for the devilish Krampus. Christian Magby composed and directed the music including some parody numbers. But all the patrons, including one birthday group and Director Lisa Adler’s daughter, Sophie, had a riotously happy evening. The show runs about 2.5 hours, and there is plenty of free parking; but plan early as you have to fight your way down to Little 5 Points. But, it’s worth it, . . . BIGTIME.